The San Jose Sharks haven’t been a thorn in the side of the Flyers — they’ve been a hatchet. Since the lockout of 2004-05, Philadelphia has gone 0-4-2 against the Western Conference power, being outscored 30-16 during that span. And that’s just lately. The Flyers haven’t cracked the Sharks in 11 previous meetings, dating back to Dec. 21, 2000, which marks their last win over the Bay Area teals. However, this season, the two squads have been on different paths. And come 7 PM tonight at the Wells Fargo Center, it could be the Flyers that go Shark hunting and bring that near decade-long winless drought to an end. Not again: Flyers try, Turco says no. It looks like the Flyers will have to find a goalie at auction. According to Pierre LeBrun and E.J. Hradek of ESPN, the Flyers received permission to negotiate with Dallas goaltender Marty Turco, only to feel the familiar burn of being sent away. The Flyers may have just found their next goaltender. According to CSNPhilly.com, the Flyers have a verbal agreement in place with the San Jose Sharks to acquire the rights to goaltender Evgeni Nabokov. Over the past week, there has been a constant rumor floating around that Lukas Kasper, former Shark and 22nd overall in the 2004 NHL entry draft, has a tentative deal with the Flyers or more accurately, the Adirondack Phantoms. A deal has not yet been announced by the team, however, talking to Director of Player Personnel Don Luce on Monday at the Flyers’ practice facility in Voorhees, N.J., it’s clear the Flyers are aware of the situation. The body language that Luce presented made it clear that he was aware of the situation, but he still refused to make a comment. And although there has been no resolution to the rumors, it is evident that Philadelphia is involved in the pursuit of the 22-year old Czech. But if they will land him still remains to be seen. Source: Flyers have agreement with forward Lukas Kaspar? According to an overseas source and now this NHL free agency site, the Flyers may have come to terms with 6’2, 225 lbs., Czech forward Lukas Kaspar. 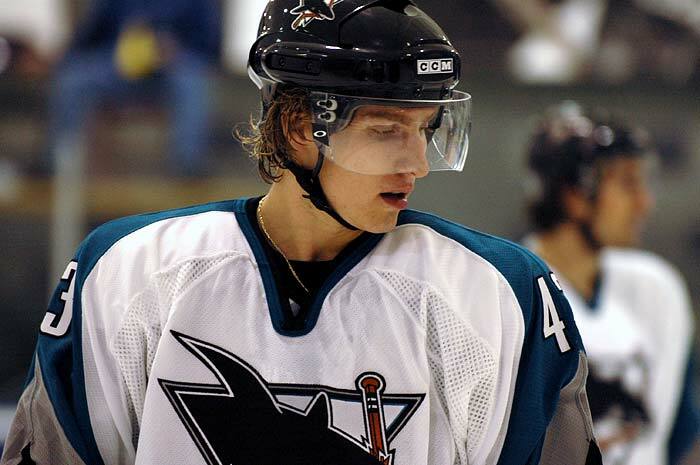 Kaspar was drafted 22nd overall in the 2004 NHL entry draft by the San Jose Sharks. Due to some inconsistency and forward depth on San Jose at the time, the power forward played just 16 games with the Sharks, scoring four points during that span. Primarily an AHLer with the Worchester Sharks, Kaspar verbally agreed to a deal with Dynamo of the KHL after the 2008-09 season in which he tallied 17 goals and 27 assists in 65 games. However, sources say that Kaspar couldn’t deny the offer the Flyers made. Terms were not disclosed and official word could be pending a physical. Kaspar is known for his ability to use his large frame, as well as possess a decent shot and some passing ability. He isn’t likely in the Flyers’ plans for this year, as he could be another low-risk, high-reward type acquisition that General Manager Paul Holmgren likes to make. However, if Holmgren dares give him a one-way contract, which would keep him from being sent to the AHL without permission, he could be placed on the wing of a scoring line and could potentially be a 15-20 goal guy considering his skill set. But if the contract is two-way, the Flyers, who do not have a lot of forward size in the system, could use Kaspar as a player who could can step into the lineup in case of emergency. I’m working to confirm this rumor and will have more hopefully soon. Two months after Anaheim Ducks’ forward Corey Perry was suspended four games for blatantly elbowing Flyers’ rookie Claude Giroux in the head, the notoriously dirty right wing got a taste of his own devices in his team’s 1-0 loss to the San Jose Sharks, Sunday. During the post-game wrapup, Perry was whining to the media that Sharks’ goalie Evgeni Nabokov kicked him with the toe of his skate during a pileup in the crease.